"A delicious and wholesome bread. I buy the 7-grain cereal in the bulk section of the supermarket." Select Whole Wheat Bread cycle, and Start. Four stars is not enough for this recipie as it is the best bread machine resipie that I have ever tried. I made this bread for Thanksgiving dinner, and it went over great! I used 12-grain cereal instead, and it was delicious! I love how easy this bread is and how delicious it turns out! It's a really tasty way to do something good for your body! This is a fantastic recipe! 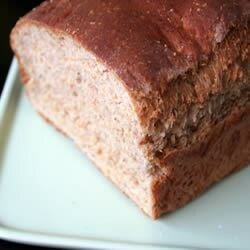 Everyone who tates this bread since I started using this recipe goes crazy over it!